It feels like a lifetime ago Crashland was announced for the Switch eShop and it's basically because the last we heard about the title was way back in March. The developer Butterscotch Shenanigans has now confirmed the game will be released next week on 8th November. 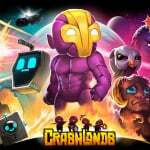 Crashlands is a 2016 sci-fi survival adventure with top-down shooter mechanics, where you take on the role of Flux Dabes - an intergalactic delivery trucker who 'crash lands' on an alien planet. Your job is to keep her alive so she can complete her delivery on time. As noted in the tweet below, you'll be able to team up with a second player in the new couch co-op mode - which is making its debut on the Nintendo Switch. Are you excited for some Crashlands survival action? Tell us in the comments. Am I the only one who thinks he looks like purple Iron Man? @ReaderRagfish that was his name till copyright was realized. Great game. And, like Cat Quest, the game will become significantly more fun now that tap-to-move controls will be replaced by the Joy-Cons. Great iPhone game, should be a great Switch game with the use of a controller. Does it still do cross-save? Played a lot of this between phone and PC, and will drive in again if that's still present. Haven't played this game in3 yrs, but played it during a bad run with the flu and bedridden. Got super far and loved it! Looking forward to diving in again. I guess, I can´t stand the continous hopping animation of the characters. If the price is right I might double dip. Played a bit on IPad but the controls would be so much better on switch. @justin233 I don't think I understand. @ReaderRagfish I agree it looks like purple Iron Man. Man my big bro played this a whileeeeeeeeeee. back on his phone. Looks fun with muliplayer! Brilliant game with great humour. Ideal in anyone's Switch collection.